It’s no secret that Amazon is into drones, from testing deliveries with PrimeAir in the U.K. to patenting ways to turn lampposts and church steeples into perches for the umanned aerial vehicles (UAVs), the ecommerce company has thought of just about everything when it comes the flying devices. And apparently now, that includes how to stock them mid-air. 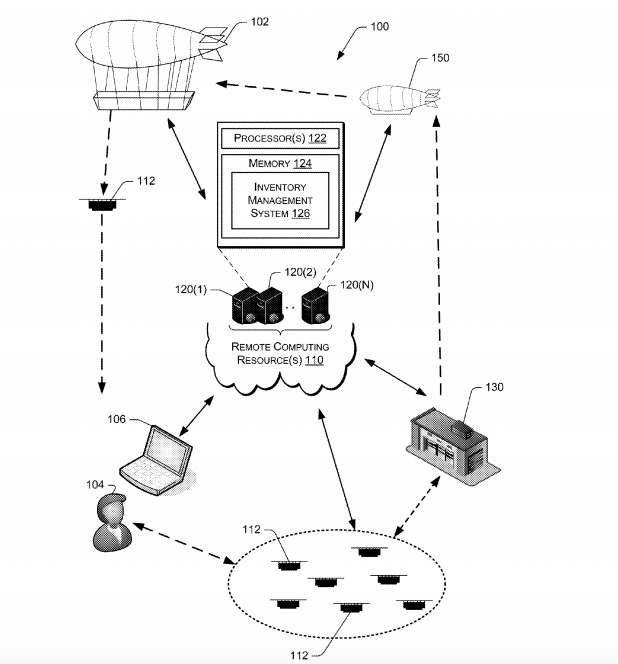 Amazon recently received a patent for a blimp-like warehouse that would act as a launchpad for those delivery drones of the future. According to the patent, the giant floating “airborne fulfillment centers (AFC)” would be situated over high-population areas or events, like festivals or sporting games. The AFC would be stocked with commonly purchased items making it easier for customer to get their goods in a timely manner. Once a customer places an order, fulfillment instructions would be sent to the AFC and a UAV within the center would prepare the item for delivery to the user. When the UAV departs the AFC, it may descend from the high altitude of the AFC using little or no power other than to guide the UAV towards its delivery destination and/or to stabilize the UAV as it descends. In one example, Amazon says that consumers visiting a football game could expect to use the AFC to procure certain times like food for tailgating. “In advance of the event, the items may be delivered to the AFC in a quantity sufficient to satisfy the expected demand and the AFC may navigate to a position such that UAVs deployed from the AFC can safely navigate to the location of the event and deliver the items, thereby satisfying the demand,” the patent states. For the most part, the AFC would stay in the same spot, but could travel to lower altitudes in order to make deliveries in a more timely manner. While Amazon has already tested drone deliveries in the U.K., there’s no guarantee the company will actually follow through to make the AFCs a reality. But if they did, you could have a grocery store floating above your house someday, so there’s that. Previous When Is The Best Time To Buy A New TV?